• Donate and receive a gift of the DVD of “The Art of the Steal” for donations of $35 or more! The movie has a retail value of $24.98. 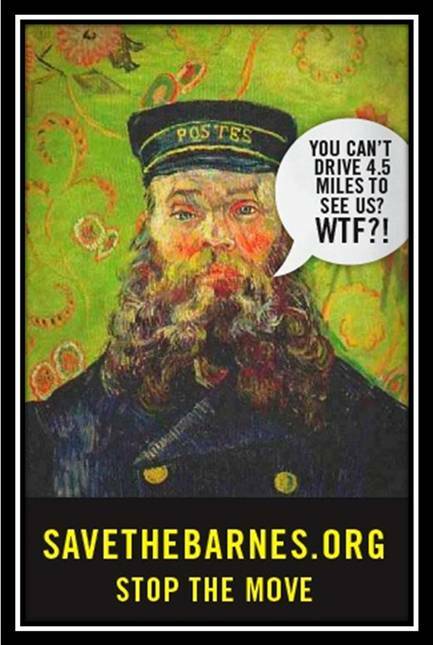 Can This Documentary Save The Barnes? A Sneak Peak. The countdown begins: On Feb. 26, The Art of the Steal -- The documentary about the struggle for the control of the Barnes Foundation -- opens in theaters (two days after it can be seen on demand) in New York and Philadelphia. (Don Argott) “We are a young country, and we don’t respect our history as much as we should — especially in Philadelphia, where it should all be about preserving the history. We have Independence Hall and the “Rocky Steps,” and [you would think the Barnes Collection] would be something we’d want to champion and preserve as well. But it’s the opposite of that, and that’s a travesty. As much as the powerful people involved, The Pew [Charitable Trust] and the Annenberg [Foundation] do great things for Philadelphia, it doesn’t mean they don’t make mistakes and shouldn’t be held accountable for them. “The Art of the Steal: The Untold Story of the Barnes Foundation” is a riveting — and tragic — documentary film chronicling the gratuitous ruin of a school outside Philadelphia that houses an incomparable art collection. It's a classic story of destroying the village in order to save it. Except this little saga comes with an unexpected twist: “Saving” the Barnes turns out to have been a sham, as the title's claim of artful theft implies. (Full disclosure: I was interviewed for the film and appear, uncompensated, in it.) That slowly evolving turn of events finally leaves a viewer slack-jawed and angry.